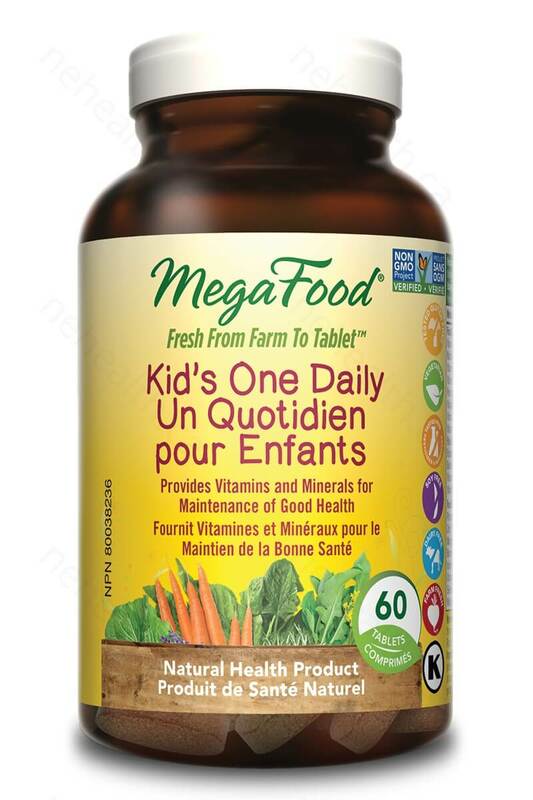 MegaFood Kid’s One Daily is a comprehensive multi-vitamin formulated by a mother for children ages 5 and older. Each mini-tablet has been designed to be easy for a child to swallow and does not contain any sweeteners, flavorings and food colorings. 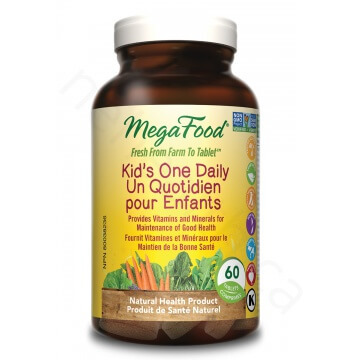 The convenient one daily serving provides 24 essential nutrients to support healthy growth and development in children. FoodState® Farm Fresh Fruit Blend provides protective antioxidants to support immune defenses, vision health and more. 2. Food and ingredients are tested 3 times to ensure purity standards. 3. Slo-food Process™ used to optimize nutrient content with utmost care. 4. Twelve different certifications, including GMP, Vegan, Non-GMO, Dairy Free, Gluten Free, and more! Non-medicinal ingredients: Farm Fresh Fruit Blend (fruit phenolic phytonutrients from organic blueberry, organic cranberry and organic orange), Organic Brown Rice, Vegetable Lubricant, Cellulose (protective coating) and Silica. Children take 1 tablet per day with food. Take a few hours before or after taking other medications.